In mid-2009, the Collin Co. Election Registrar notified the Texas Secretary of State that the county wants to be selected to join Texas' ongoing Vote Center trial program. 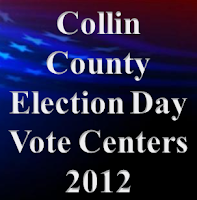 Collin County was accepted into Texas' Vote Center program starting with the November 2009 election. Election Day Vote Centers replace traditional precinct-based polling locations. Registered voters may cast their ballots at any Vote Center within the county in which they live, rather than having to go to their traditional precinct-based home neighborhood polling place on Election Day. Election Day Vote Centers, like Early Voting Polling Centers, are connected by a distributed ePollBook system (Votec's VoteSafe software pkg running on Windows-based laptop PCs) to the countywide master voter registration data base servers. When a voter checks in to vote, he or she is "posted" in the countywide data base as having voted, thereby ensuring that he or she cannot repeat the process at another polling place. 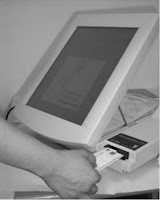 Voters are provided "electronic ballots" appropriate to their precinct related voter registration address to access the AccuVote touch screen voting booths. 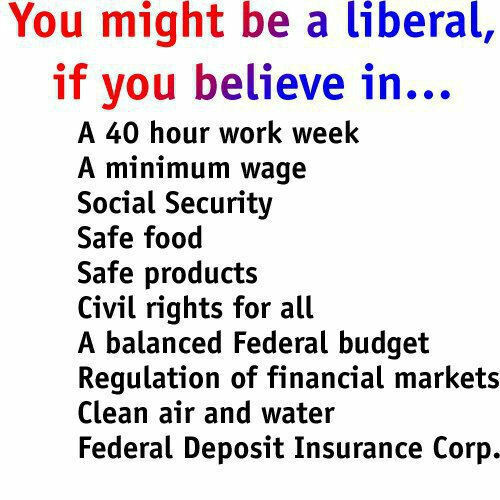 This is exactly the same voting process as for early voting. Eight other counties in Texas have also met requirements to form countywide Vote "Anywhere" Centers, for general elections, including: Erath, Floyd, Gaines, Galveston, Lampasas, Lubbock, Midland and Travis. Lubbock County was the first to implement countywide Election Day Vote Centers in 2006 after the 79th Texas Legislature passed House Bill 758 establishing the program. The 2010 Vote Center program did not run as smoothly as the initial 2009 pilot. Some of the 72 Vote Centers open for business on Election Day, November 2010, had some of the longest wait lines that Collin County voters had ever experienced. When Election Day polls closed at 7:00 p.m. at the Christ United Methodist Church Vote Center, where I was the Alternate Judge, there was a 3.5 hour waiting line - we voted the last person in line just before 10:30 p.m. The Clark High School Vote Center didn't vote its last person in line until after 9:45 p.m. and several other polling locations also had long wait lines when their Judges called, "polls closed," at 7:00 p.m. The primary reason some Vote Centers built up long wait lines was that those locations did not have enough polling equipment -- SafeVote ePollBook laptops and electronic ballot encoders for voter check in and AccuVote touch screen voting booths -- and clerks to support the voter traffic flow. In that 2010 mid-term General Election, 16.4 percent (69,614) of registered voters turned out to vote at Collin County's 72 Vote Centers. That is an average turnout traffic of 967 voters per center, but actual Vote Center traffic ranged from a high of 2,722 ballots cast at the Allen Municipal Courts Building Vote Center to 106 Ballots cast at the Westminster Volunteer Fire Department Vote Center. Assuming that a total of 67 percent of the 458,872 registered Collin Co. voters will vote in the 2012 General Election, then 307,444 will have cast ballots by the time the last ballot is cast on Election Day. 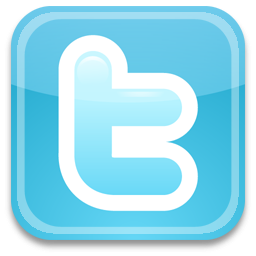 If Collin Co. has a 70 percent total registered voter turnout, then 321,210 will cast ballots in the 2012 General Election. Assuming that about 70 percent of those who will vote have already voted early, then something like 81,000 to almost 95,000 in-person ballots will be cast by 21 percent of registered voters at the 67 Vote Centers located around the county on Election Day 2012. That is an average turnout traffic of 1,209 - 1,418 voters per center, but actual Vote Center traffic will likely range from almost 4,000 voters at some Vote Centers to less than 200 voters at other Vote Centers. Comparing projected average 2012 Vote Center traffic (1,209 - 1,418 voters per center) to the lower average 2010 Vote Center traffic (967 voters per center) suggests that long polling place wait lines are again possible - and even probable - on Election Day 2012. Historically high traffic voting locations, such as the Allen Municipal Courts Building, Plano Carpenter Park Recreation Center, Plano Christ United Methodist Church, Plano Clark High School and other 2012 Collin County Voting Centers, will most likely have lines throughout Election Day and continuing for some time after Judges call, "polls closed," at 7:00 p.m.
Have you seen those funky QR (quick response) "bar" codes floating around and wondered what they are and how to scan them on your iPhone or iPad? QR codes are used to convey useful information like web URLs, contact cards, e-mail addresses and more. While QR "bar code" readers aren't built into the iPhone and iPad, there are, of course, QR code scanner apps you can download. 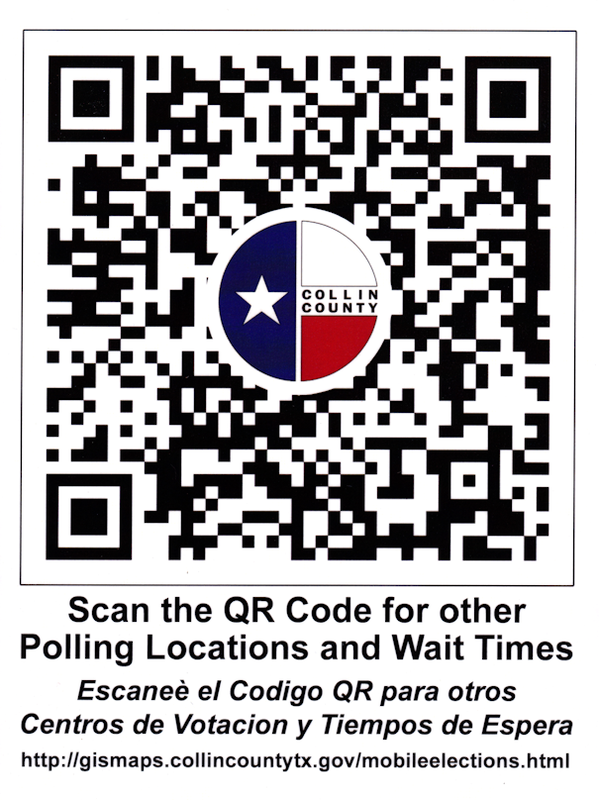 The Collin County elections office will trial a QR "bar code" Vote Center service at half a dozen locations on Election Day to help voters locate Vote Centers with the shortest wait times. 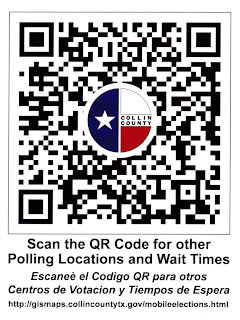 The Vote Center QR code scan launches a Collin County Election Vote Center location map. After you have installed and launched the QR Scanner App, you can point your iPhone camera lens at the QR code image at right to test the map service. The scan should launch the Collin Co. Vote Center location map. I've tried the free Apps Quick Scan and QR Reader for iPhones on the Collin Co. QR Vote Center bar code. 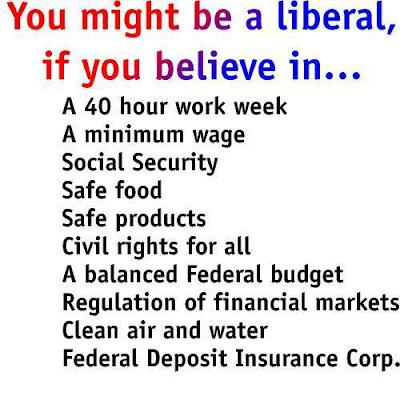 Both work just fine. Look for the QR Code poster on or around the yellow sandwich board 100' electioneering distance markers at the Election Day trial locations. The Plano Carpenter Park Recreation Center Vote Center, where I will work as the Alternate Judge, will be one of the locations where QR code posters can be found on the yellow sandwich board 100' markers.